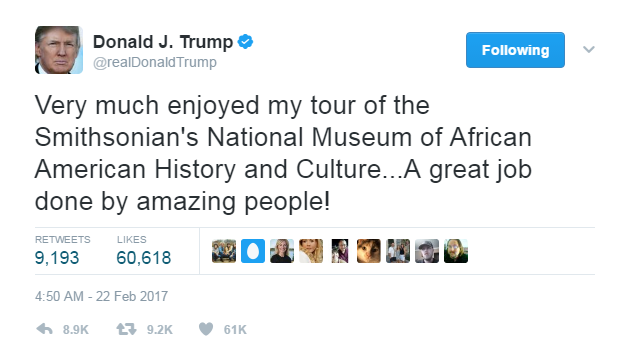 You "very much enjoyed" exhibits on the horrors of slavery and the cruelties of racism and the never-ending battle for civil rights in our country? Enjoyed? ENJOYED? Did you even go IN the museum? Or did you just stand by the doors wearing your uneducated-rich-white-male-privilege blinders and waving to the media that you obsessively accuse of being fake but whose existence you'd die without while you struggled to think of a way to reduce a photo op in a long-named museum to a dismissive, meaningless tweet? I'm touring the National Museum of African American History and Culture this summer. And I expect to weep in sorrow and horror and shame as I witness the gut-wrenching barbarity and oppression and indifference inflicted by white people on black people starting centuries before this country was founded and now proudly emerging from the shadows in the ugly Zeitgeist of your unholy, unpresidential administration. I expect to be left numb and aghast and overwhelmed by what I've seen and experienced and learned when I leave the museum. I expect to be overcome with the same appalled, devastated sense of hopelessness I've experienced every time I've left the United States Holocaust Memorial Museum. And I expect the experience to propel me ardently forward in what I profoundly and humbly hope is my perpetual evolution toward understanding and compassion and sympathy and kindness and decency and justice and a resolute dissolution of prejudices both acknowledged and undiscovered that I harbor. The National Museum of African American History and Culture isn't a collection of exhibits celebrating the work of their curators. Describing it as "a great job done by amazing people" is at best an admission that you've never stepped foot in a museum and at worst a thundering declaration of deliberate, dismissive racism -- media-blasted after a perfunctory, last-minute charade of solidarity near the end of Black History Month, no less. Are you really that uneducated, uncultured and callous? Did you post this tweet to convince yourself that you're not paralyzingly uneducated, uncultured and racist? Did you do it to convince your supporters that you don't know that they are? Did you honestly think this tweet would elevate your standing as a public figure? Elevate the national discourse on race and culture? Elevate what's left of your value as a human being? Have you very much enjoyed what you've become?